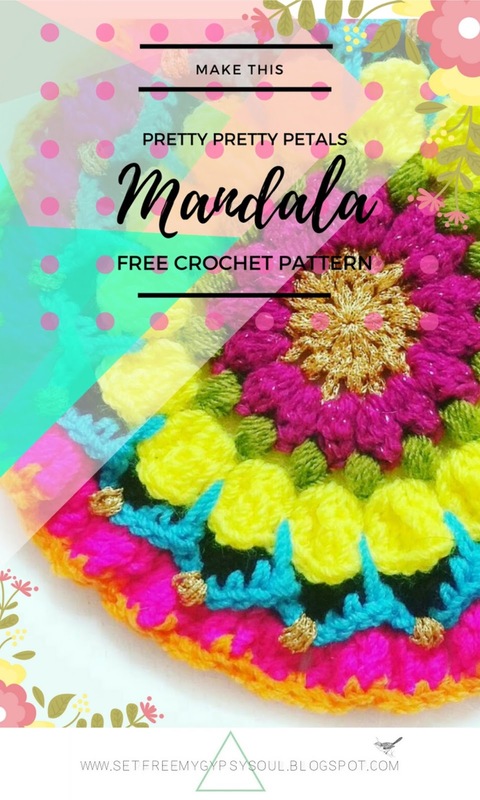 Make this bright and voluminous flower design crochet mandala with lots of pretty petals using a combination of easy crochet stitches with this week's free crochet pattern for Mandala Monday. It's perfect for doilies, cushion covers and mounting in embroidery hoops! This gold yarn is Anchor Metallic from +Hobbycraft and is soooo sparkly and beautiful! 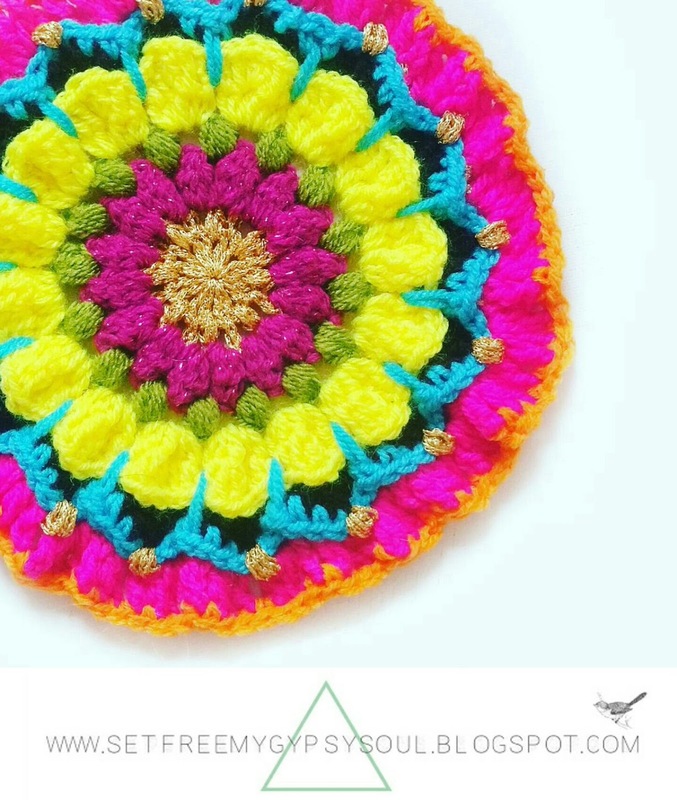 This Mandala also uses that gorgeous turquoise colour WI yarn from +Hobbycraft too... it's one of my faves at the mo! 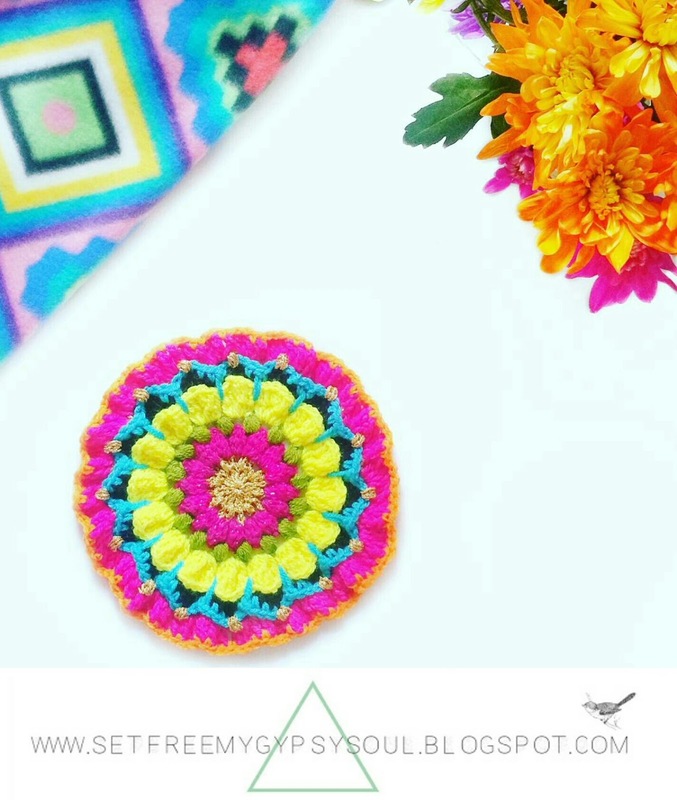 Made using a 4.5 mm crochet hook and DK yarn, this pretty floral centered crochet mandala is folk-art Boho inspired but with a modern colour pow twist. Made using a 4.5 mm hook and DK yarn, she measures approx. 8 inches across. Round 1: Start with a magic loop and ch 3 as 1st tc (US dc). 15 tc (US dc) into the loop. Join with sip stitch. Round 2; Ch 1 and make a 3 y/o puff stitch into the space. Ch 3 and dc (US sc) into the next space. Ch 3 and make a 3 y/o puff stitch into the next space. Repeat Ch 3, dc (US sc), ch 3, 3 y/o puff stitch around the work and fasten off. Round 3: Join new yarn and ch 2. 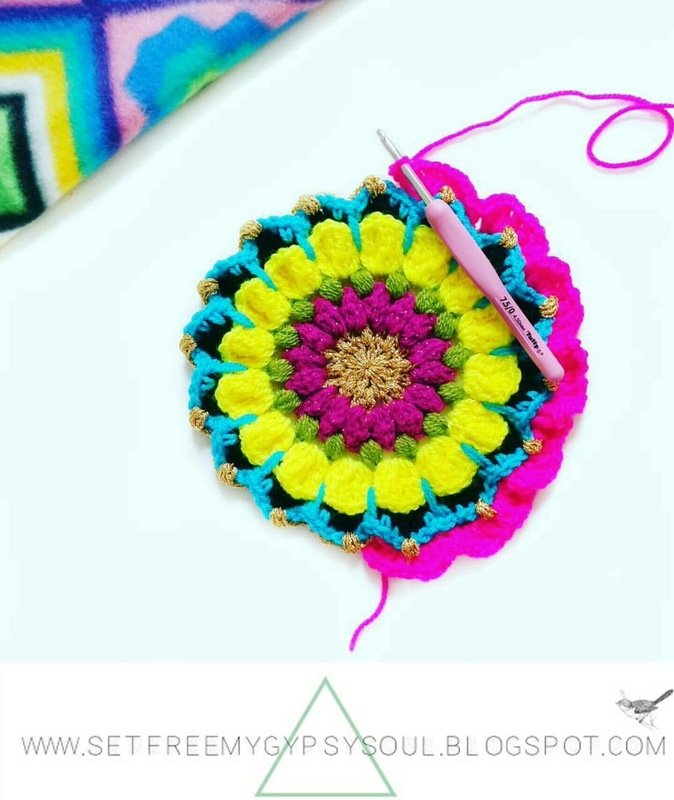 Turn your work and make a 4 y/o bobble stitch (5 loops on the hook) into the space. Repeat 4 y/o bobble stitch and ch 1 around the work. Join with slip stitch and fasten off. Round 4: Join new yarn into any ch 1 space. Ch 1 and make a 5 y/o puff stitch into the same space. Repeat 5 y/o puff stitch and ch 1 around the work. Join with slip stitch and fasten off. Round 5: Join new yarn in any ch 1 space. Ch 2 as 1st htc (US hdc). 2 htc (US hdc), ch 2, 3 htc (US hdc) into the same space. Ch 1. Repeat 3 htc, ch 2, 3 htc, ch 1 (US 3 hdc, ch 2, 3 hdc, ch1) in each R 4 ch space. Join with slip stitch. Round 6: Ch 3 as 1st tc (US dc). Tc (US dc) into the next space. 2 tc (US dc) into R5 ch 2 space. Tc (US dc) into next 2 spaces. Dc (US sc) into R5 ch 1 space. Repeat tc, tc, 2 tc, tc, tc, dc (US dc, dc, 2 dc, dc, dc, sc) around the work. Join with slip stitch and fasten off. Round 7: Join new yarn through the back post of any dc (US sc). Ch 4 and bpdc (US bpsc) into the next R6 dc (US sc). Repeat bpdc (US bpsc) plus ch 4 on each R6 dc (US sc) stitch. Join with slip stitch. Don't fasten off! Round 8: Ch 4 as 1st tc (US dc) plus a ch 1. Tc (Us dc) and ch 1 4 times into the loop. Repeat 5 x tc + ch 1 (US dc + ch 1) in each loop around the work. Join with slip stitch and fasten off. Round 9: Join new yarn into any ch 1 space between your 5 x tc + ch 1 (US dc + ch 1) shells. Ch 1 as 1st dc (US sc). Now spike stitch down into the R5 ch 1 space, and dc (US sc) into the same space you joined the new yarn. Dc (US sc) into the next 4 spaces. Repeat dc, spike stitch, dc followed by a dc into each of the next 4 spaces again. (US sc) Repeat around work. Join with slip stitch and fasten off. Round 10: Join new yarn through the back posts only of any spike stitch. Ch 4 as 1st dc (US sc) plus a ch 3. Make a 4 y/o puff stitch into the space between your 3rd and 4th dc (US sc) stitches of R9. Repeat bpdc (US bpsc) of spike stitch, ch 3, 4 y/o puff stitch, ch 3 around the work. Join with slip stitch and fasten off. Round 11: Join new yarn into any ch 3 space. Ch 4 as 1st tc (US dc) plus a ch 1. Tc (US dc) and ch 1 3 times into the same loop. Tc (US dc) and ch 1 4 times into each loop space around the work. Join with slip stitch and fasten off. Round 12: Join new yarn into any ch 1 space. Ch 1 as 1st dc (US sc). Dc (US sc) into every ch 1 space around the work. Join with slip stitch and fasten off. 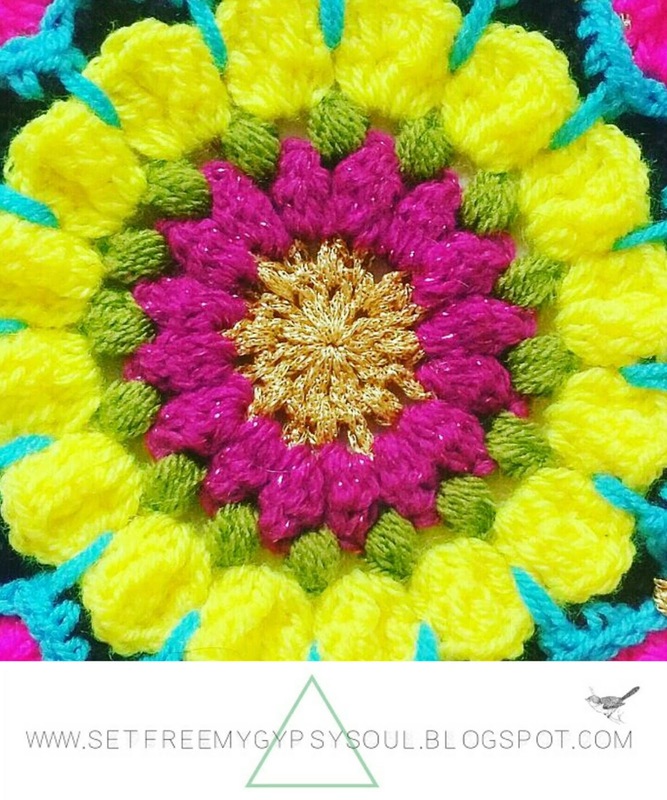 And don't forget to show me your version of the Pretty Pretty Petals crochet mandala on Instagram by tagging me @setfreemygypsys0ul or using the hashtags #SFMGS or #prettyprettypetalsmandala. I also have a new hashtag on Instagram.. #SFMGSswoon to showcase bright, colourful, bohemian craft every week! Join the group now by tagging your work - all crafts welcome - with #SFMGSswoon and you could be featured!